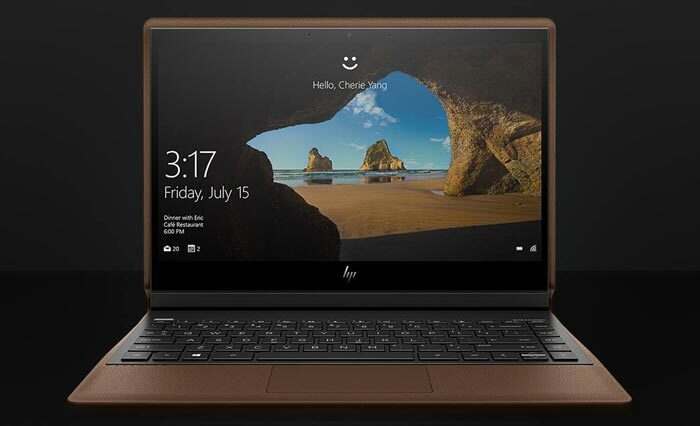 HP has launched a desirable new convertible PC by the name of the HP Spectre Folio. 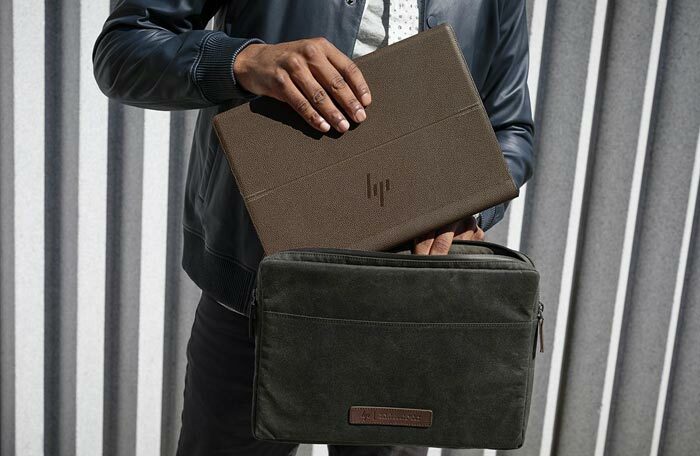 In an email to HEXUS the firm probably overeggs its design achievement by claiming "HP Reinvents the PC" but it is indeed clearly a convertible that "combines style, versatility, and mobility". 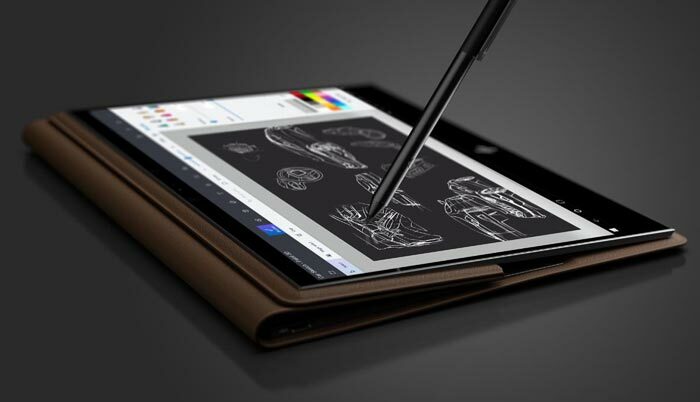 What makes the HP Spectre Folio stand out is its genuine leather construction, shortly followed on by its portability and supporting components. This machine is claimed to be "the world's first leather convertible PC". The leather is described as 100 percent chromed tan, full-grain leather which might mean more to handbag aficionados than PC enthusiasts, but it looks good in the images and videos. Leather doesn't just look 'executive' with its gain, stitching and edging but it is durable and can help cushion impacts and some people even appreciate its appearance more as it wears. Initially the HP Spectre Folio will only be available in one leather shade dubbed 'Cognac'. Opening up the folding device, it is possible to lean the screen into various positions / tilts for optimal typing, reading, and inking tasks. There is a tent mode too, which neatly tidies away the keyboard and a tablet mode, both made natural and easy to use with HP's use of leather and magnets. HP says that its Spectre Folio incorporates one of the smallest motherboards in the industry, with one of Intel's 8th Gen Intel Core i7 (Y-series) processors on board. This choice of powerplant facilitates a fanless design. 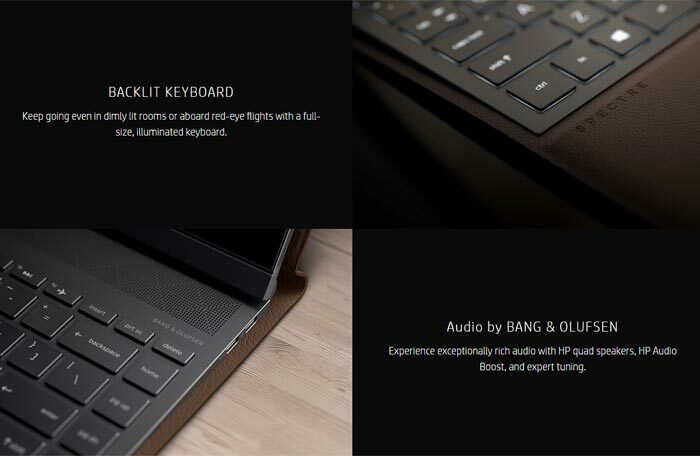 Other key specs/components are; up to 16GB of RAM, up to 2TB of SSD storage, Bang & Olufson sound, gigabit LTE connectivity with dual-eSIM and nanSIM, backlit keyboard, digital pen, and a battery offering up to 18 hours of stamina. Buyers are met with a 13.3-inch touchscreen choice from HP. Initially a 300-nits FHD display or a low-power, 1W 400-nits FHD option will be available but later in the year HP will make available a 4K panel option. Pre-orders for the HP Spectre Folio will begin October 1, 2018, at HP.com. The HP Spectre Folio is expected to be available in Cognac Brown with an Intel Core i7 processor and LTE connectivity at select Currys PC World retail locations and HP.com beginning end of October – at a starting price of £1,499. The HP Spectre Folio with the 4K panel option is expected to be available in late December. HP's Spectre Folio Pouch and the HP Spectre Folio Sleeve are expected to be available at HP.com in November for £39.99 and £59.99 respectively. £1,499 would get you a RTX 2080Ti with no cow. It's all about the peeled cow. The only problem is that every time this thing gets warm, the smell is going to make me want a steak. Wow that is ugly! Doesn't appeal in the slightest, especially at that price. It's clearly pitched against the surface line - and I would see no reason to look at HP instead tbh unless I really liked dead cow skin.